Electric vehicles have a turbulent history within the American automobile industry. The first all-electric cars were introduced in the late 1800’s when the American automobile industry was in its infancy. Several fuels were competing at that time, including steam, electricity, and of course gasoline. Over time, people realized the steam cars were too impractical, and the electric vehicles took too long to recharge with not enough range, so eventually, gasoline won out. Shortly after Hurricane Katrina decimated New Orleans in 2005 fuel prices started an unprecedented rise. Gas prices have more than doubled since March 13, 2000, which was the first time in our nation’s history the price of gas crossed the $1.50 per gallon threshold. The past 13 years have seen the shortest time period for a doubling of the price of gasoline in history. Unfortunately for our national economic interests, coffee isn’t the only black liquid Americans are hopelessly addicted to, so this substantial rise in gasoline prices has caused major economic consequences. Enter part of the solution, the Nissan LEAF. When I arrived to take my LEAF test drive, I didn’t know what to expect. Nissan’s press kit on the vehicle raved about how painstaking measures were taken with the vehicle to reduce wind noise. They included a specially designed antenna and headlights that cut the air to create less drag and noise around the rear view mirrors amongst other things. At 29 years old I’ve certainly driven my fair share of vehicles. My aging Honda Accord is car #18 for me. This, coupled with stints working at car dealerships actually selling the things, I’ve likely driven somewhere in the neighborhood of 150 different makes and models, a fair number of them with gas/electric hybrid power trains, including Nissan’s own Altima, 3 models each from Toyota, Honda and Lexus, one Chevy and two Fords. Even with the extensive behind the wheel experience I have, one of my friends who currently drives a Prius but had in the past driven a GM EV1, cautioned me to expect something radically different from any of the hybrids I’ve driven. When I sat in the driver’s seat, the first thing I noticed was how conventional the interior of the car is. Gearshift? Check. Radio? Check. Climate control? Check. Even the most important of features (yes, I’m talking about you Mr. iPod Connector) was easy to find and smartly positioned. When I turned on the car, it sounded more similar to when I start up my MacBook Pro than my Honda. The LEAF is equipped with an intelligent key, so all the driver needs to have is the key on their person in order to get in the car, and start it. Once the green ready light popped on, we were off! The eerie silence is fairly familiar to anyone who is used to driving a Prius or other dual mode vehicle at low speeds, one of the first sounds I noticed the car making was the turn signal. One of the things, despite my friends warnings, I had not prepared myself for is how hard it is to gauge speed. At speed, the only noises the car made were a slight whirring sound from the electric motor, and road noise from the tires. Since the car has no transmission, there are no gear changes to judge your current speed; furthermore there are no engine noises whatsoever, so the only thing you have to gauge your speed at all is other traffic and the speedometer. It’s impossible to explain how much you rely on those other factors until they’re removed, and you’re driving 50 in a 35 zone. The car rides exceptionally smooth. Both power delivery and suspension control are effortless and I barely noticed a few bumps that I notice in my Honda. Even with the silky smooth ride, the vehicle was able to comfortably take a highway on-ramp I routinely use at speeds where other cars I have driven produce tire chirp and start to feel a bit squirrely. At highway speed, the only sounds you hear are the noises of other vehicles on the highway. Many of the detractors of the LEAF cite its high price and short range as reasons not to buy the car. While yes, 100 miles per charge (Nissan Factory figure) and a $32,780 base MSRP on the LEAF is a bit intimidating, the overall value of the vehicle is evident when you look at the hard numbers. First of all, very few people drive 100 miles in a given day. For most of us, work is within 10-15 miles of our home, and even for those on the high side at 15 miles, there is still plenty of drive time when you get back from work to head to the grocery store, go to the gym, and potentially even have a local night out on the town. The 8 hour charge time is a downside, however, if the car is plugged in at night when it’s parked, for most people, that would be well in excess of the 8 hour charge time. As of the time of writing, pre-owned Nissan Leaf pricing is starting to come down to the levels of comparable cars. There are reasons for this that I have neither the time, nor the space to get into, but that being said, a quick search on Cars.com the other day yielded a 2011 Honda Civic, and a 2011 Nissan Leaf with nearly identical equipment, and nearly identical mileage. The Leaf’s premium had dropped to just over $1000. For fuel alone, the leaf has an approximately $.10 per mile advantage over the Civic, which means the additional cost of the Leaf would be made up in just 10,000 miles. Granted, at some point you will have to replace the battery in the Leaf, but there’s also a good chance that when this happens, a Leaf owner will likely just ditch the car without a significant drop in the price of Lithium Ion batteries. Overall, the Leaf (while a spectacular feat of engineering) isn’t for everyone. If you live far out in the country, and commute to Downtown DC every day, you might want to stick with a more conventional vehicle for now as there is currently very limited EV charging infrastructure in the Washington DC region. Over time, as more electric vehicle charging infrastructure is added, the distance away from your daily routine and where you live will become less of a factor. 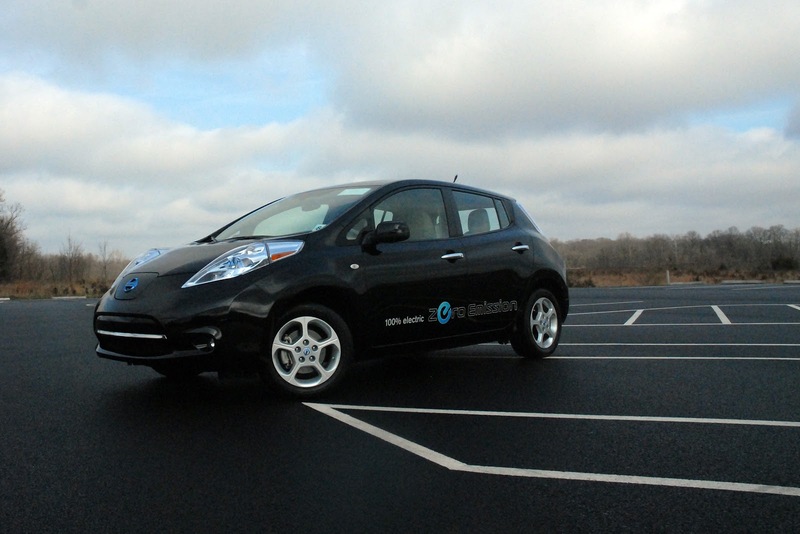 Overall, I strongly recommend the Leaf if you have the budget to have a car that’s strictly devoted to short-distance driving, or even if you have a commute that’s less than 50-60 miles round trip every day, and you have the garage space for more than one car, particularly if it's a vehicle you plan to buy new, or late model used. The Leaf is not the car for you if it’s going to be your only car, and/or you routinely drive more than 60 miles in one day. High mileage drivers in the LEAF have already reported significant battery life drain, particularly those in extremely hot weather climates, and those who rely heavily on fast-charging. These criticisms are significantly less pronounced when you venture out of the states of Arizona and New Mexico, but are still there. One huge thing that’s going for it, is as battery technology improves, and costs fall, a new battery pack for the car at 100,000 miles could conceivably be a better and less expensive than the one that was installed in the car from the factory. At current replacement costs of around $8,000 (estimated after calling a local dealer, but I couldn't get an exact quote on it) any reduction in price would be very much welcomed. As far as buying one at the 100,000 mile mark goes? It has yet to be determined. I very much wanted to give this car a comfortable “BUY at 100K” rating, because it’s a car I absolutely adore. Unfortunately the technology is too new for that recommendation, despite that I see no reason why the body, paint and interior materials shouldn’t hold up well past 100,000 miles. There is a strong chance I will end up with one (at this moment, I am planning on purchasing a pre-owned LEAF at some point in the mid 2013-mid 2014 time period), and you’ll get to see my writing on it, but for now, wait for other early adapters to shake out the bugs before writing the check. Because of that, unfortunately I have to rate it as “Wait and See”. On a final note, there is one great feature of this car that I haven’t yet mentioned. When you’ve got one in your driveway, you’ve just one-upped the smug Prius driver who lives 3 doors down. For more information on the Nissan LEAF please visit www.nissanusa.com/leaf. Many details contained in this article were provided by Nissan USA. This version has been significantly updated and edited from the original, but still relies on much of the original framework; including the original test drive, and unpublished photos from the original Photo-shoot. The car pictured is a 2011 model year vehicle. Labels: 200k, 2nd100k, Buying a used car, Electric Car, New Car, Nissan, Nissan Leaf, Plug-in Car. Starting Next Wednesday (November 14) I'm going to be introducing a new feature: current or recent (max 1 year old) model year vehicles I've driven, and how I think it's going to withstand the test of time to either be a wonderful purchase at 100,000 miles, or if at 100,000 miles it might be a good idea to consider a different vehicle. Over the past couple weeks I've driven a number of vehicles that meet this criteria, including a 2012 Nissan Leaf, 2012 Mercedes C250 Coupe, 2012 Dodge Caravan, 2012 Ford Focus and Fiesta, 2012 Fiat 500, 2012 Toyota Camry, and dozens of others. I won't be writing about everything I drive, because many cars are changing for the 2013 model year, but I'm going to cover as many of the 2012's as possible before the calendar year changes over on Dec. 31st. Final touches are still being put on the entries, so I can't tell you yet which is going to come first, only that there are several in progress. I've been working on this feature for awhile now and am very excited to have it finally launch! As of today, I've driven the Honda 16,430 miles in just under a year, which puts me at nearly 2000 over the average American's 12-15,000 mile range in a given year. For the most part the time with this car has been (as expected) completely trouble free. At this rate, I'll be hitting 200,000 miles in this vehicle at some point in September of 2015. There is, however, a very good chance this car will not be in my possession when that happens. Don't get me wrong. The car still works. It gets me from point A to point B like a champ. In nearly 17,000 miles of driving it has yet to leave me stranded, but with that in mind there are a few repairs that are going to be needed in the very, VERY near future. First, the Air Conditioning is gone. Shot. Kaput. According to my mechanic, a simple re-charge is out of the question, I need an entire new compressor. The cost for this compressor is roughly $1000 that I'm just not willing to spend on this particular vehicle. As we're heading into winter, this isn't a HUGE issue, as I don't need the AC to keep the car cool, but I do need the AC to keep the interior of the car dry; that in and of itself is huge. During Sandy, I got cabin fever, and decided to head to the gym for a quick workout before it got too horrible to drive. Because there is no AC in the car, the moisture is not pulled from the air when the defrost is on, as such, every window in the car fogs to a point you just can't see out when it's humid outside. That is downright dangerous. Second, the front suspension is having issues. The car handles wonderfully. Significantly better than my 1999 Accord V6, but that's primarily due to the fact that it's a manual rather than an automatic. That being said, however, when I hit the speed bumps on the way into my townhouse complex tonight, I heard the tell-tale grinding that let me know it's time for new front axles/cv joints/cv boots. Total cost? About $500. Finally, Honda paint. You can see my complaints about Honda's crappy paint in a post on the 1999 Accord here. Unfortunately Honda did not improve their paint quality between 1999 and 2001. And from the looks of the Civic that parks next to me at school, they didn't bother messing with it for the 2006 model year either. There are many other issues that could end up convincing me to sell. Overall it's just not a car I'm happy with. Mechanically it's been wonderful (despite the impending repairs). Unfortunately the car just has no soul. It never complains when I ask it to do something, but it also never tells me what it wants to do. It's far more content being used as an appliance running errands around town than being pushed through corners, or even taking a nice, long highway trip. After two hours in the car, I usually can't wait to get out. As of today I'm scheduled to drive one of the 2013 Accord's for a new feature that's coming. I'll be looking for a car that is a bit more energetic. Hopefully they figured out a way to jazz it up a bit. Generally speaking, this accord has done very well with fuel mileage. My lowest mileage for a tank was 26.11 mpg, my highest was 30.42. Overall, that's not gas mileage I can really complain about. For a now 12 year old car with over 150,000 miles on it, it's doing quite well. A few months ago, however, I decided I'd replace the tires on the car since one had a razor imbedded in it, and the other three were approaching the point where they'd no longer pass the Virginia state safety inspection process. Also, since I keep my tires rotated I generally try to replace all four at once, as opposed to piecemeal. Usually it saves money on the individual unit, and it also usually scores you freebies like rotations; one time I even got a 5 year road hazard plan out of the deal. So, that being said, I've now put approximately 12,000 miles on the tires, they've been rotated twice, and I'm starting to have doubts about the tires that I purchased. There are good things about them. The wear is incredible. After 12,000 miles, the tech who did the rotation for me said there is no question in his mind these tires shouldn't last me for another 70,000 miles based on how well they've worn over the first 12,000. That can be an affect of the driver, more than the tire itself, and I do understand as such; so no angry comments when your set only gets 20,000 miles. Then there's the bad. And there's a lot of bad. First and foremost. My average gas mileage in the vehicle was 28.05 mpg before I put the tires on it. My overall mileage since I've gotten the tires? 28.57. So, I've gotten a full half mpg of fuel economy boost out of the tires. When compared to the premium I paid for them over a set of regular Goodyear Assurance, I need to get about 100,000 miles out of the tires simply to break even. Quite frankly, I'm not going to get 100,000 miles out of them. Second, wet traction. It's horrible. It's not quite as bad as a dedicated summer tire, but I'd expect something labeled all-season to provide enough wet weather traction that a slam on of my brakes over wet leaves would not lock up all four tires. This happened in the Accord, and ended up with a run to the Honda dealership who verified that the 4 wheel ABS was in fact in full working order. The tires have such poor traction that all four wheels locked tight in an emergency braking maneuver and started sliding. When that happens, no amount of ABS can save you. Third: Dry traction. Not good. Again, they're labeled all seasons, but the compound that they use is such a low-resistance compound, I get four wheel drift and tire chirp when I'm taking corners that with the previous tires on the vehicle the car just held on tight...namely the 90 degree corner I take while I'm getting to work. I used to be able to take it at 35 mph while hitting the apexes properly, now the fastest I can do it without loads of over-steer is 26. Fourth: Noise. These tires are loud. My 6,000 mile rotation schedule has not been enough to keep them quiet. They're not so loud it's bothersome but they've got significantly more road noise than the previous tires on the car. The verdict at 12,000 miles: The tires aren't great. They're not worth the premium over the regular Goodyear Assurance Comfortread for numerous reasons, however, they're not so horrible that I'm going to swap them out early...yet. Part of the reason for that is some issues I'm currently having with the Honda which will be discussed in a later post.